I like squonking. Sounds wrong, I know, but there it is. I've said it... It's out in the open. Now, before you get your overactive imaginations engaged and start thinking the wrong thing, take a peek at Super_X_Drifter's excellent video. 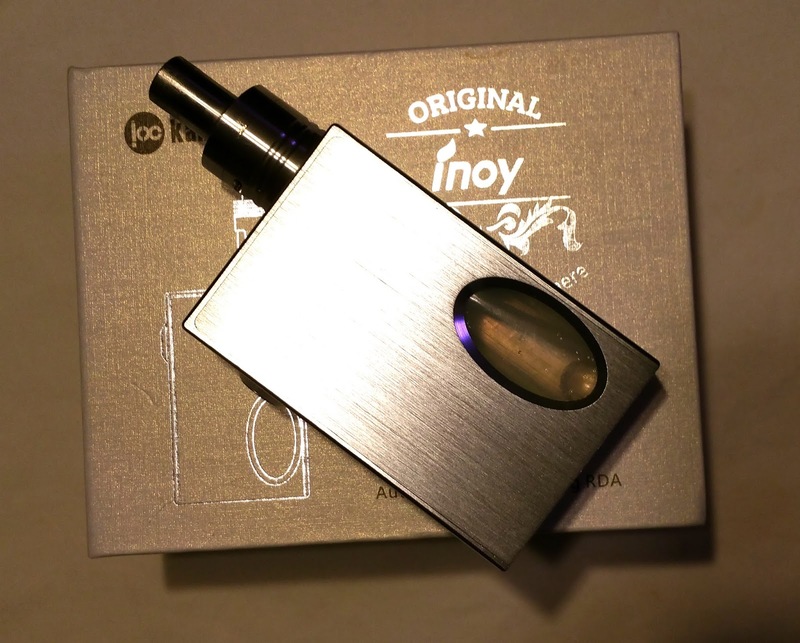 Now, with that out of the way, tonight I'm reviewing the Kangxin Inoy 60 Watt Temperature Controlled Squonker. 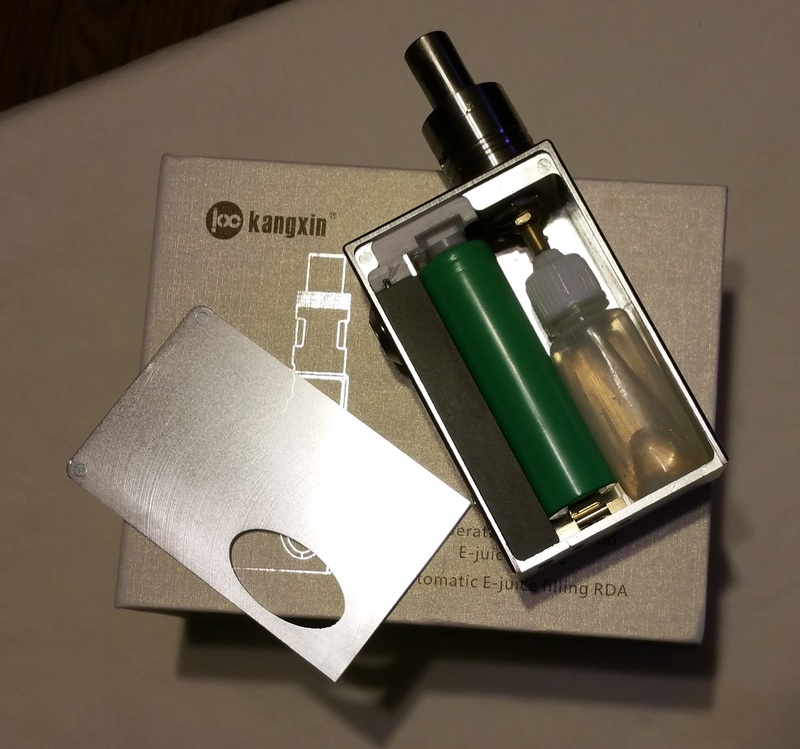 This is a device I purchased with my own greenbacks from Focalecig in a group buy deal for $33.50. Yada yada, disclaimer, my opinions, YMMV, yada. The device arrives in a white box. 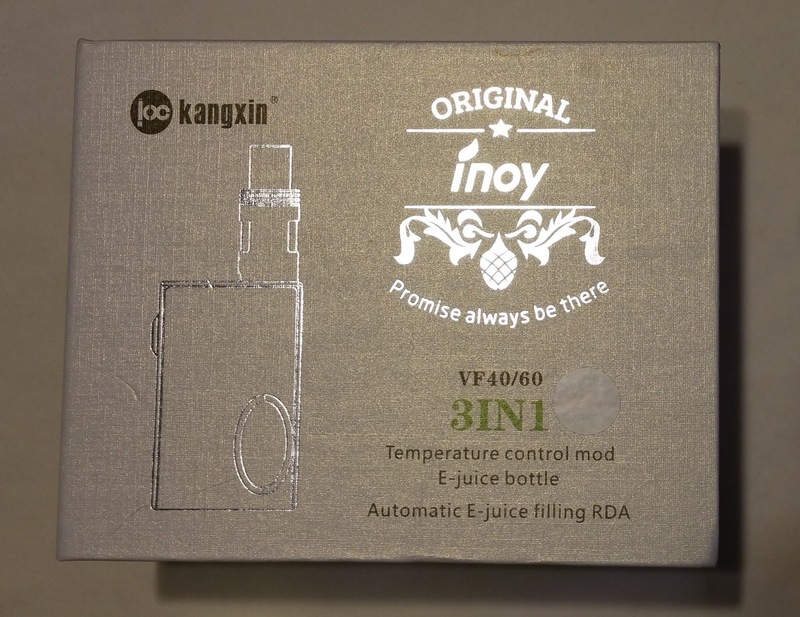 On top, there is a lot of branding, and the name of the device as "Original Inoy Promise always be there VF40/60 3IN1. A little silver sticker next to this indicates both the color of the device and the actual wattage (60). There is also a 40 watt version of the device, but, I have not tried it. 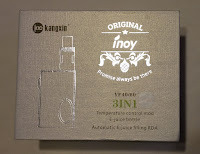 The cover of the box continues "Temperature control mod, E-juice bottle, Automatic E-juice Filling RDA." My device did not come with the RDA (I knew this and I am fine with this as the RDA looks to be pretty poor... it features bottom air for a bottom fed atty and that spells leaks in my book. It also has a 3 post design, but only air for one coil.) There is nothing on any of the sides, and on the bottom, there is a little more branding, some certifications and some warnings. I'm actually glad to see the warnings regarding smoking, health, pregnancy, intended age of user, but would have liked to see something about battery safety. Flipping the box open, there is a foam slab holding the mod snugly, and a spot that would have held the RDA. Under that is a USB cable and a spare plastic bottle, cap, and tube assembly. The entire manual is written on the inside cover of the box and is quite spare. There are some specifications, but I am not certain that they are accurate as this box is written for both the 40 and 60 watt mod. For instance, the website claims that the resistance range is between 0.09 and 2 Ohms, but the box states 0.1 and 1.0 for TC and 0.15 to 2.0 for power. It's a nice enough box, but very boxy. Very, very boxy. Being primarily aluminum, it's also very light. The shiny, brushed aluminum slab measures in at around 85 x 56 x 24.5 mm. The buttons protrude a little from the front on either side of the flush mounted, very slightly crooked and off-center screen. The flat-topped firing button is set into a conical cap. To fire the device, you need to press into that cap a bit. The bottom buttons are set into a shallow, oval well. All of the buttons are fairly tactile and clicky, but the firing button does rattle a bit. Beneath, there are two screws and a crooked micro USB port on the bottom, a vast expanse of brushed aluminum on one side, and another expanse broken only by the beveled oval squonking window that measures 17 x 32 mm. On top, above the squonking window, is a slightly recessed well and a stainless steel 510 connector. The center pin appears to be silver plated, but is neither adjustable or spring-loaded. Your atties will either fit, or they won't. The brushed aluminum exterior looks nice enough, and it resists all but the juiciest fingerprints. Sliding off the side panel with the squonking window, which is held in place by two in its slot by two small magnets, reveals the inside. Here, there is a softish plastic bottle with a white cap and a tube feeding to a hollow pin that feeds directly up through the 510's center pin. Next to that is a slot for a single 18650 battery. The bottom is a spring tab negative terminal on a brass block (this is what the two screws on the bottom are holding in place). At top is a positive terminal. I know this from experience, and, in that case this is a good thing as there are no markings. Next to that is the black box that holds the chip. About that chip... It's a DNA clone that will run in temperature control up to 60 watts. The 60 watts is nice, and the button presses are pretty familiar. Five clicks locks the device, another five clicks unlocks it. When locked, holding the up and down buttons simultaneously gives the "Hold to change temp" prompt. Then the temperature can be changed in ten degree increments in Fahrenheit from 200 to 600. After 600, the TC can be turned off by clicking one more time. Scrolling down below 200 puts the device into Celsius where the increa se and decrease are in five degree increments from 100 to 300 degrees. Clicking once at 300 degrees turns the TC off. When scrolling down in either C or F mode, after reaching the bottom, the device switches to the other mode. Oddly enough, it seems to start in at 450 degrees F. In power mode, you can adjust the wattage in 0.1 watt increments from 1 to 60 watts. The device also claims to supply from 1 to 9.9 volts. Clicking the down button and fire button while the device is locked turns stealth on and off. Pressing the up button and the fire button flips the screen left and right. When unlocked, pressing the up and down button simultaneously locks the power. When attaching a new atomizer (or reattaching an old one), or replacing batteries, upon first firing the device the prompt "New Coil Up Same Down" appears. This allows for resistance lock and appears to work even in power mode as my Stainless Steel coils do not jump after firing. Then there's the new button click command: While locked, pressing all three buttons changes the wattage/temperature display area on the screen to a number between 10 and 100. This is the Nickel Purity mode. It was developed in China to allow people without access to "pure" nickel to vape in TC on lower grades. It is, however, very close to a TCR scale. It is no where near as advanced as something like the SMOK XCube II (and kin) or the DNA200, but it will allow you to scroll up or down to select a TCR value. Here are a couple handy TCR/Nickel Purity numbers acquired from the excellent thread "TC beyond Ni200: Nickel Purity, Dicodes; Ti, SS, Resistherm NiFe30; Coefficient of Resistance" on the E-Cigarette-Forum. Ni200's TCR 0.006 = 60. Titanium's TCR 0.0035 = 35. 316L Stainless Steel TCR 0.00094 = 10. I also found some great information on DJLsb's website. I am happy to say that Nickel Purity works! 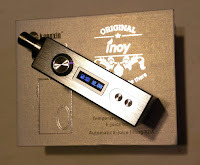 I set the device to 14 for 430 Stainless Steel's TCR of 0.00138, and have had a very nice, temperature controlled vape! I have been using this off and on for a couple months, now. I like it well enough. 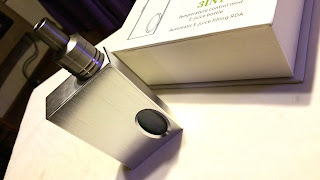 For the majority of this review, I used a Low Pro BF atty built with a single transverse coil (using both airflow ports) to .81 Ohms with 430 stainless steel. I have run it in temperature control mode and in power mode. In TC, I experimented with TCR values using the Nickel Purity function, but eventually left it on 14. With the TCR set and the wicks wet, I got a very nice vape. When the wicks began to dry, I did notice some pulsing. A quick squonk, though, and I was back in business. In power mode, I ran it between 20 and 30 watts. The weight is nearly non-existent when compared to some of the other behemoths I often tote about. The bottle holds quite a lot of e-liquid, and is relatively easy to squeeze... er, squonk... The device is also quite small. With the Low Pro RDA on top, I can nearly hide the entire device in my hand. The fit and finish of the external components is quite nice. There is nearly no rattle anywhere except the fire button. The door slides in easily, slides out easily, and holds firmly. When vaping, the chip functions exactly as it should in all modes. The battery life is a little low, I think. I've not put it on a timer, but I can go through two, fully charged 18650s in a day with this where I only go through a single 18650 in my several of my 70 - 75 watt devices. Even so, it's not terrible... The device does fire without a great deal of delay. I've not put a stop watch to it, but if there is any delay, it's so short, I can easily live with it. However... you knew that was coming, right? There are quite a few problems with the device. For starters, there's the shape. Did I mention that it was boxy? The corners are painfully sharp! Looking at the charging port's placement and the ever so slight cant of the screen, I am sure that if I chose to tear the box apart, I would be greeted with a mass of hot glue. The screen has a refresh rate and viewing angle similar to several antique grayscale laptops I used to own. Scrolling through the wattage or temperatures becomes a bit of a guessing game as the display turns into a gray blur. And if you look at it from any angle other than dead on, the display appears inverted in color. Actually, that's kinda cool, but... All of my squonking atomizers fit and worked, but I did have to adjust some. The lack of a spring loaded center pin or adjustable center pin is troublesome. The firing button's placement in the shallow cone makes it just a tetch difficult to press, but it does make it harder to accidentally fire the device if it's in a pocket or laid on its face. If I lost or destroyed this device today, would I rush out and replace it? Enh... yeah, I probably would replace it. Rush? Not so much. The device functions as it should and at $35 to $45 dollars it's not a bad value. At least not when compared to the larger, even poorer functioning $60 50 watt Geyscano from YiLoong or the $350 40 watt Vaporflask Squonk. Finish - 7/10 - The ever so slightly crooked screen, the crooked micro USB port, and the sharp edges take it down a couple notches. It would also be real nice if a newer screen were used. That said, the lack of any real button rattle and the nicely fitted battery door, and the brushed aluminum finish make for a nice looking mod. Form - 9/10 - Again, sharp corners digging into my palms is not my idea of a good time, and the slightly recessed firing button is a very small bother. Beyond that, the device is easy to hold and use. Function - 9/10 - The addition of the Nickel Purity feature to this device coupled with the apparent accuracy makes it very versatile. Final - 8.3/10 - B grade! Can a heating coil in an oven be fixed?